Whether you have just built a pergola or fence or you have an existing wooden structure with exposed post tops, you will likely want to consider capping them off. Whether you have just built a pergola or fence or you have an existing wooden structure with exposed post tops, you will likely want to consider capping them off. Wood has a tendency to split over time – especially a vertical exposed piece of wood, such as a pergola post. Sun beats down on the exposed wood (even if it’s stained and sealed thoroughly), drying out and shrinking the wood fibers, and then any rain or snow or ice or other weather penetrates into the wood end. This causes swelling, warping, or just regular weather damage over time. Good news: There’s an easy and cost-effective way to prevent this, by capping off the tops of your exposed posts with plastic post caps. Post caps are available in a variety of different sizes. You’ll want to measure the true size of your beam – in this case, a 6×6 cedar beam measures just shy of 5.5”x5.5”. Pay attention to the interior measurements of your post cap, especially if you’re ordering online. The underside of the cap looks something like this. Pretty straightforward. Before you do anything else, place the cap on the top of your pergola post. If your post is at the height you want it, and if the cap fits perfectly, guess what? You’re done. Congratulations. No gluing or screwing required, as long as the cap is a snug fit. But if you want to trim down the height of your pergola post, it’s time to measure and mark the height you want. Make sure there’s enough space on your remaining pergola post that the cap can slide down over it. 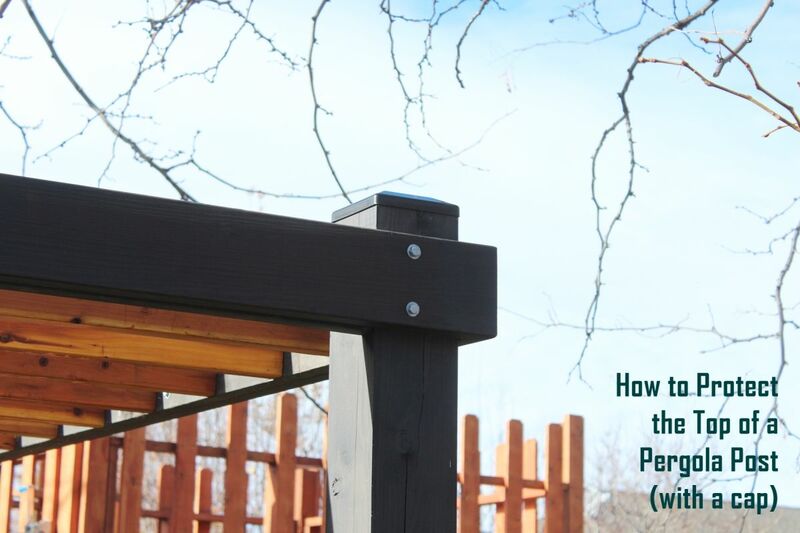 Now connect your marks with flat, level lines across two sides of your pergola post – the side you’ll be sawing from, and the side you’ll be looking at as you saw. It’s important that you purchase a reciprocating saw blade that’s large enough to easily cut through the width of your pergola post. Remember to account for the back-and-forth movement of the blade while sawing; this will require a few extra inches on either end. Consider the diagonal distance as well. A 4×4 post, for example, will cut just fine with an 8” saw blade. But a 6×6 post, as shown in this example, requires a much longer blade of 12” in length. Line up your reciprocating saw blade with the first flat, level line you’ve marked. Hold it at this level firmly as you begin sawing, making sure you stay level on both ends of the saw. As your saw blade gets further into your pergola post, this is where your second drawn line comes into play. Do your best to maintain level on the far side of the saw (since you can’t see over there), and be sure to follow along your second flat, level line. This will help to maintain a flat, even cut for your pergola post. Simply set your pergola cap on top of the pergola post, pressing it down as tightly as it will go for a flat, even finish. This really completes the look for a modern pergola frame, with the added benefit of being a protective final step as well.